Taste test: Like the other Kettle chips, these are a good chip, but they aren't served well by the flavor. 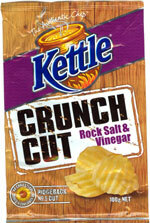 I am hoping the rest of the Kettle Crunch line is flavored better, because the underlying chips are excellent. 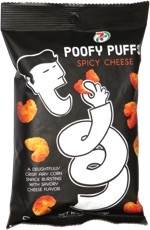 But they have failed to get the combination of salt and vinegar right. Since that's my favorite flavor, I have to be ruthless in my review. Smell test: Very strong vinegar aroma.